Summary for the Busy Executive: Freakin' brilliant. 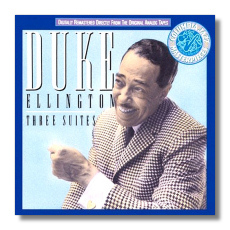 I never knew how Ellington got the nickname "Duke" until I saw him live. Then I understood immediately: this was the most elegant fellow I'd ever encountered. I came to jazz fairly late, in grad school, and even now I feel I'm playing catch-up. I don't know nearly enough, even after more than twenty years of serious listening. So don't expect me to talk knowledgeably about Ellington's career or his connections to Calloway's Cotton Club band or to spout Brunswick matrix numbers. What I think I can talk about is the small part of Ellington's output that touched classical music. Many classical composers had incorporated jazz and proto-jazz elements in their work, going all the way back to Debussy's graceful versions of ragtime. However, it took George Gershwin's Rhapsody in Blue to galvanize composers and to get artists to take jazz as seriously as they took Brahms. I'm not calling Gershwin's work the best amalgam of jazz and classical or even calling it jazz, in the sense in which most present-day aficionados use the word. I talk strictly about its impact. Gershwin became an archetype which many jazz musicians found enormously attractive. J. P. Johnson forsook a career as band leader and one of the great jazz pianists to devote himself full-time to composition based in black dance-band music. Ellington himself - deploring what he called the "lampblackisms" of Gershwin's Porgy and Bess - was nevertheless inspired to Black, Brown, and Beige and a career which raised displays of solo virtuosity to mini-concerti, the "mood" piece to concert suite, and the vocal to "sacred concert." All of these things have encountered critical resistance, I believe, for the following reasons: Critical ignorance leads the rest. Classical critics don't usually have a firm idea of jazz tradition or procedures, and they tend to seriously undervalue both. Racism probably entered into the initial critical reaction, but it doesn't explain the current resistance. I believe most classical critics are keeping Ellington's work at arms' length not because he's black, but because they just don't get it. They don't get it because they don't listen to jazz enough, and they don't listen to jazz because they don't take it seriously. They don't take it seriously because they haven't listened seriously to enough of it - a circle of ignorance. Furthermore, a great deal of Ellington's work resulted from a collaboration between himself and the composer and arranger Billy Strayhorn. Consequently, critics don't know how to assign credit: did Ellington or Strayhorn come up with this particular wonderful thing? Testimony from various sources doesn't help, since almost every witness says that Ellington and Strayhorn's techniques were identical. To finish a piece on deadline, Ellington would work on a passage, wake up Strayhorn, and catch a nap while Strayhorn took over, often in mid-measure. The fact that Ellington and Strayhorn frequently couldn't remember who thought of what doesn't help matters. Nevertheless, we can deal with the last problem by assigning credit to both, creating an entity known as Ellington-Strayhorn. As orchestrators and harmonists, Ellington and Strayhorn found inspiration in Debussy and Ravel. Relatively late in his career, Ellington decided to release an album devoted to orchestrations of other composers and chose Tchaikovsky's Nutcracker Suite - not exactly a safe choice, since many consider Tchaikovsky one of the great orchestrators. Certainly Tchaikovsky knew how to handle strings, as the Serenade in C amply proves. However, the jazz band doesn't normally use massed strings, rather massed winds and brass. Furthermore, the jazz rhythm section changes the orchestral balance radically, mostly because it must fight for attention among the stronger-voiced winds. The jazz rhythm section - bass, guitar, and drum kit - is far more forward in the texture than the usual discreet and widely-spaced booms and dings of the symphonic percussion section. The standard rap against Ellington's big concert works is that - compared to Tchaikovsky, Elgar, or Bartók - they don't use strings all that well. However, one can turn this around. I know of no classical composer who uses reeds and brasses as imaginatively as Ellington. With the three works recorded here, the rap becomes irrelevant, since Ellington-Strayhorn wrote for the Ellington orchestra. The backbone of Tchaikovsky's orchestra is the string section; the backbone of Ellington's, the rhythm section. That is, strings dominate the Tchaikovsky sound, with winds and brass providing color. Ellington's sound continually changes with new and surprising combinations of reeds and brass, although the bass and percussion are constants. This means that you can't simply take Tchaikovsky's lines straight and give them to winds. You've got to make them idiomatic for winds. In doing so, Ellington-Strayhorn recompose substantially, altering Tchaikovsky more than Stravinsky did Pergolesi for the Pulcinella ballet, and the work becomes more theirs than the Russian's. They don't just put a jazz beat behind Tchaikovsky's ballet, although I don't mean to imply that the jazz rhythms they come up with are routine. In transmogrifying Tchaikovsky to something idiomatic to jazz, they extend Tchaikovsky's basic ideas and harmonies in new and surprising ways. Gunther Schuller mused rather wistfully about the benefits of classical musicians looking hard at an Ellington score. For him, there were leaps of high imagination on every page. In Ellington's Nutcracker, they seem to come in just about every measure. I consider this one of the great American scores, and you'll probably never hear it at your local symphony. The "Overture" transforms the miniature delicacy of the original to an easy lope, with some unusual syncopated counterpoint. "Toot Toot Tootie Toot" (originally titled "Caliopatootie toot toot tootie Toot") begins with some absolutely brilliant writing for solo winds and finger cymbals, none of which comes from Tchaikovsky. When the Tchaikovsky theme appears, Ellington-Strayhorn throw in extra tasty dissonances and genuine counterpoint, taking off from jazz voicings. Ellington's Sugar-Plum Fairy prowls through the night on the arm of a deliciously insinuating sax solo from Harry Carney. The "Entr'acte" plays with overture once again, this time allowing soloists greater opportunity for display. This might be an earlier draft of the overture, too good to throw away. "The Volga Vouty" stands out for the color Ellington-Strayhorn coax from all sorts of mutes. "Peanut Brittle Brigade" sizzles as a driving big-band number, with skirls of parallel chords from the saxophones, on the money rhythmically and pitch-wise, and a powerfbaritone sax solo from Paul Gonsalves. At "Chinoiserie," Ellington and Strayhorn turn in a brilliant orchestration of solo saxes, plucked chords from the bass, and a delicate percussion seasoning from drummer Sam Woodyard. This wind writing is so spectacular as to be out of most classical composers' reach. "Danse of the Floreadores" turns the lush string writing of Tchaikovsky's "Waltz of the Flowers" into a kaleidoscopic exploration of various wind and brass combos. The finale, in the Ellington-Tizol "Caravan" vein, boasts the reed and brass sections taking long phrases in apparently one huge breath and a fantastic solo from sax great Johnny Hodges. In all, one of the outstanding examples in all music of one great composer rethinking and re-imagining another. The arrangement of Grieg's Peer Gynt suites comes closer to typical Ellington and therefore surprises me less, although I don't sneeze at it. The opening chords alone provide more to think about than many a symphony. Nevertheless, it seems a brilliant arrangement, rather than, like the Tchaikovsky, a magnificent recomposition. High points include the plucked bass chords from Aaron Bell, the Dreigroschenoper ensemble writing that open "Ase's Death" as well as the range of color at each repetition of the theme, and the almost-Cubist breakup of the theme into big-band riffs and short, tasty solos from the reed soloists (Hamilton, Hodges, and Gonsalves) in "Anitra's Dance." In 1960, the Monterey Jazz Festival commissioned Ellington for a large-scale work. Since Monterey is Steinbeck country, Ellington decided to write a piece based on Steinbeck's novella Sweet Thursday - which, in typical Ellingtonian wordplay, became Suite Thursday. The links with the prose piece seem more fanciful than literal, with "Misfit Blues" (the first movement) a musical portrait of Steinbeck himself, according to Ellington. "Schwiphti" flies fast as photons, with a punched, jagged solo from Ellington himself and fleet displays from saxophonist Gonsalves. All in all, it's one of Ellington's most focussed large-scale efforts, despite a tendency to ramble in the third movement. It ends on a swinging Ray Nance solo (on violin, yet! ), miles away from the politesse of Grapelli. I've heard only one other violinist (and not a jazz violinist, surprisingly) swing this hard. The sound is typical of the way producers like to mike big bands - a little bass-heavy, apparently to put more "muscle" in the music - but it's bearable. As for the performance, come on - it's the Ellington band. You might as well question whether Sid Caesar's writers were funny.